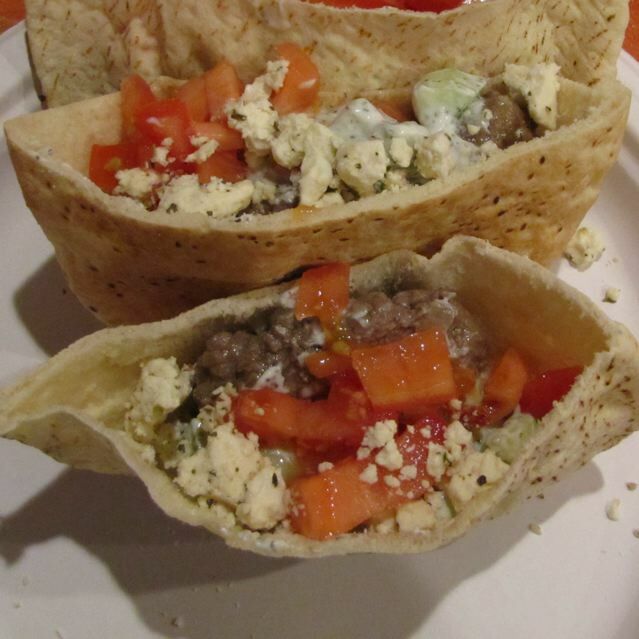 On the topic of crock pot meals… here is another recipe from the current “Fix-It and Forget-It” Magazine that is available until 4/12. It called to me because it sounded very German! 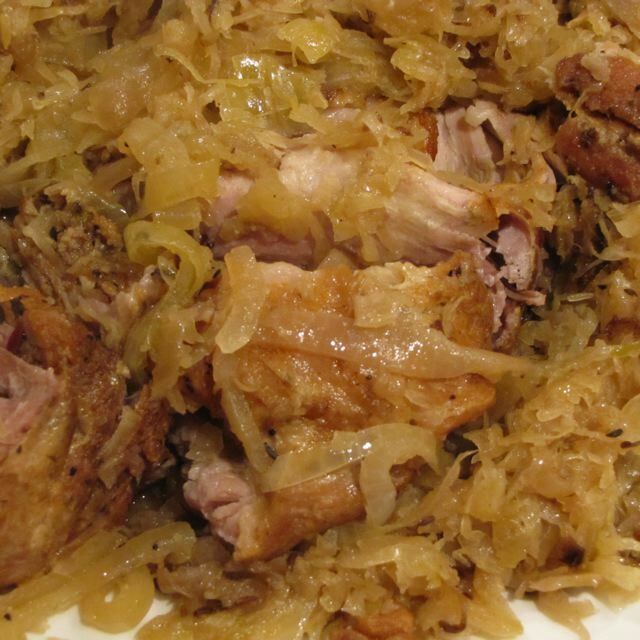 Pork and Sauerkraut with caraway is a classic German combination! This one is easy to make and very yummy indeed. Be sure to drain the Sauerkraut, but don’t rinse it – it will add flavor to the roast. After removing the pork and sauerkraut, the sauce is thickened in the end with a slurry of cornstarch. I will make this again. I served it with wide egg noodles and peas. I used a pork shoulder roast, but you could use one that is less fatty. The good thing about pork shoulder is that it really falls apart after long cooking times without being overly dry. Another change I made, was seasoning the pork with salt and pepper before browning it. It added a touch I think that was needed. Season your pork roast with salt and pepper on all sides and heat a large pot over medium high heat. Add vegetable oil to the pot and then proceed browning the pork roast on all sides, turning the roast about every 4 or 5 minutes. Once the roast is nicely browned on all sides, place it into your crock pot. Sprinkle the minced garlic over the top of the roast and top with sliced onions, drained sauerkraut (but not rinsed) and caraway seeds. Pour the water around the outside of the roast. Cover and cook for 6-8 hours on low heat. Remove the cooked pork and sauerkraut to a large platter and strain the cooking liquids. Place just the liquids back into your crock pot. In a small bowl, combine the cornstarch and cold water and stir to combine. Add the cornstarch slurry into the cooking liquid. Cover and cook for about 15 minutes to thicken the sauce, stirring occasionally. Serve the gravy with the meat. Categories: Ethnic, Ethnic - German, Main Dish, Main Dish - Pork, Method: Crock-pot | Tags: crock pot, crock pot pork, pork and sauerkraut, Pork Roast, sauerkraut | Permalink. I recently picked up a copy of Fix-It and Forget-It slow cooker magic. You should be able to find a copy until April of this year (04/12). They had several recipes that caught my eye. I liked the look of this recipe but I adapted it to serve 6 (not 4), so the sauce ingredients are doubled and instead of 4 pieces of salmon I used 6. I also changed a few ingredients in the sauce. I thought there was too much mustard, so I reduced that and I increased the sour cream and added a dash of Worcestershire sauce to give it that last oomph that it needed. I was afraid that cooking the salmon in a crock pot would make my whole house smell fishy. It was not the case. I think I found some very fresh salmon, which I am sure helped keep it from smelling too fishy. Place the first 4 ingredients into the crock pot and pour the chicken broth over them. Cover the crock pot and cook on high for 2 hours. In the meantime, season the salmon with the garlic salt and red pepper flakes. Cover with plastic wrap and refrigerate until it is time to add the salmon. Prepare the Creamy Herb sauce: Combine the ingredients listed and stir together. Taste and adjust seasonings. Cover and refrigerate until serving time. When the two hours are up for the lemon slices. Carefully place the salmon on the lemon slices. Cover the crock pot and cook on high for 30-45 minutes or until the salmon is cooked. Remove the salmon to a platter and discard the liquids. 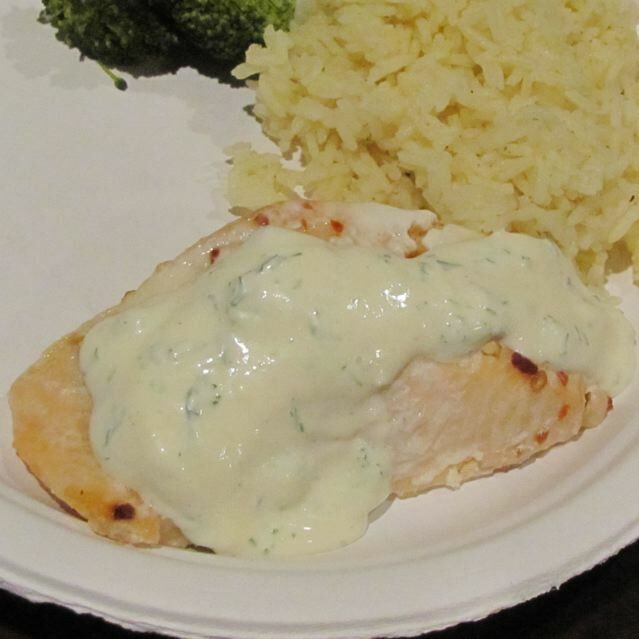 Serve the salmon with the creamy herb sauce. Good with steamed rice and broccoli. Categories: Main Dish, Main Dish - Seafood, Method: Crock-pot | Tags: crock pot, crock pot salmon, Salmon, Salmon with Herb sauce | Permalink. Desperation Dinner: You know this kind of dinner.. your pantry has some ingredients but not enough to make something you have in mind.. so you substitute. Sometimes it works and sometimes it does not work. This is one that worked and boy did it ever work! My family loves Lasagna, but I had neither ground beef or sausage to add to the filling and we didn’t want just plain or just spinach lasagne – no, that is too close to being healthy! We like to live on the side of not good for you! Well, actually, we are in process of changing that… but last year we lived!!! My brother was in town for Thanksgiving – he lives in Harrisburg, PA and we do not see him very often. Since he is single, he comes to see us about every other year. He had a craving for lasagna, but I did not have the meat as I mentioned before… but I did have this: Pepperoni! I made the lasagna as usual, except used pepperoni instead of the sausage. Baked it as usual and the result was wonderful! It is now my families favorite lasagna. I like to use my large pampered chef stoneware casserole. The sides are over 2 inches and the lasagna so far has never bubbled over like it has in a pyrex dish- but you still can use it, just place a cookie sheet under it if that is all you have. The beauty of the stoneware is that you do not have to spray it with non stick spray. To make the lasagna, ladle half a can of spaghetti sauce into the bottom of your baking dish. Place the (uncooked) lasagna noodles on top of the sauce, slightly overlapping. Combine the ricotta cheese, egg, oregano, basil and half the Mozzarella cheese in a bowl and spread half of the cheese mixture over the lasagna noodles. Top with half of the pepperoni slices. Ladle the remaining sauce from the first can of spaghetti sauce. Top with noodles. Repeat layers. 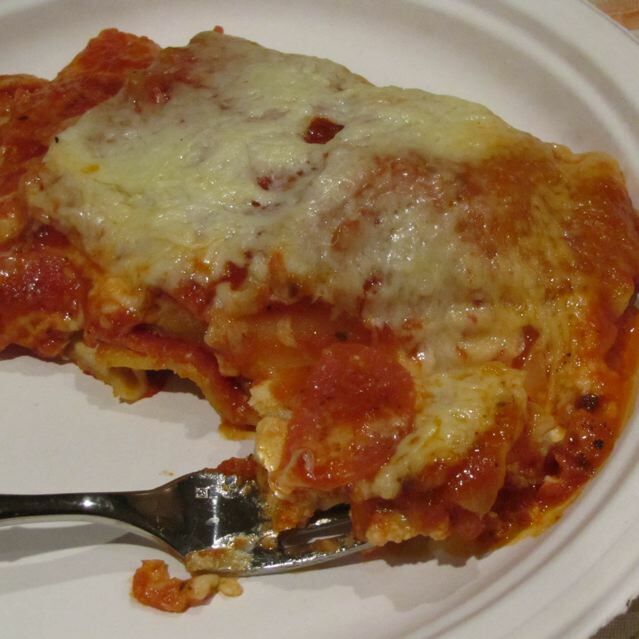 End with lasagna noodles, pasta sauce, and remaining Mozzarella Cheese. 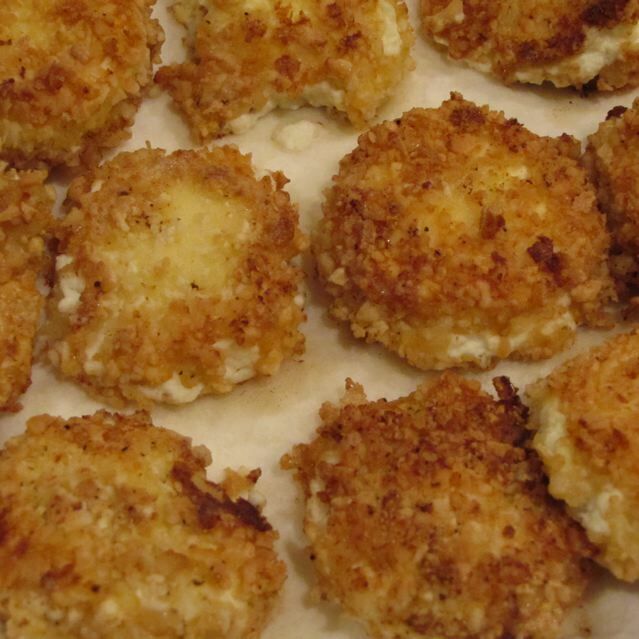 If you would like an extra crunch add about 1/2 cup shredded Parmesan cheese. Cover the pan with aluminum foil. Bake at 375 for 50-60 minutes. Uncover and cook until the cheese is melted for another 5 to 10 minutes. Remove from oven. Cover with foil again and let sit for about 10-15 minutes. Categories: Ethnic, Ethnic - Italian, Main Dish, Main Dish - Pasta | Tags: Pepperoni Lasagna | Permalink. My husband was recently looking at pizzas in various shapes on New Years Eve. He challenged me and my daughter to make one for 2012. Challenge Accepted! 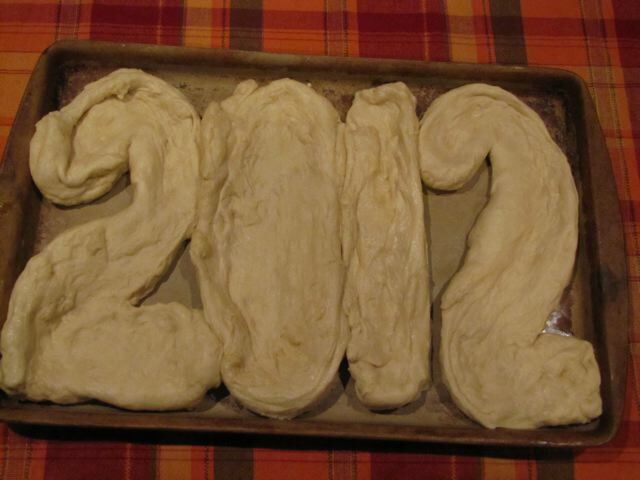 I used my usual pizza dough (but doubled it) let it rise and then formed the numbers 2012 out of the dough proceeded to top them and bake as normal. I think it turned out rather well. 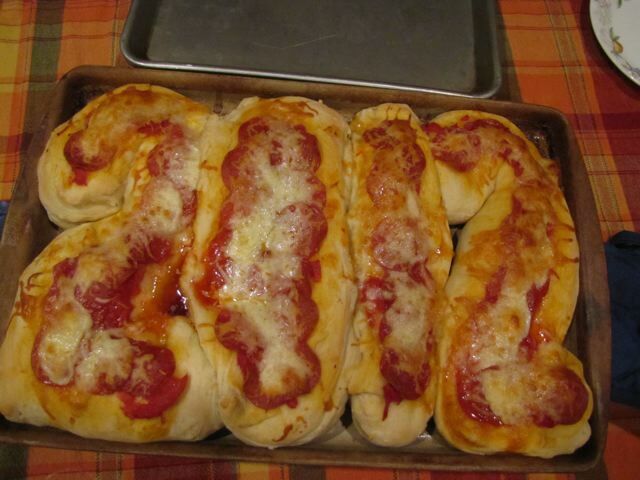 My pizza dough (link) This is my pepperoni Calzone recipe but use the dough recipe for pizza dough. Bake 375 for 20-25 minutes or until golden brown. I treated it as I would a square pizza cutting them in slices. The dough was rather thick, but it worked and tasted well for the occasion. Categories: Ethnic - Italian | Permalink.